Well, here are some sneak previews showing off the new terrain and outpost models. (models were kindly donated by our new hero: schlumpfsack ). The terrain was procedurally generated, stitched, painted and blended using some custom editor scripts written by John. Bumped terrain was achieved by using the advanced terrain shader package from the unity asset store. These are the results so far without any baked shadows or post-fx etc. Enjoy! The new refine, compose and assemble approach took some time for everyone to get used to and two recipes were proven to be incorrect (titanium mace needs 2 handles and hemp refining gives 1 extra bud). Titanium quickly became scarce as the most wanted resource for the adjusted line of weaponry. Trading is now increasingly important for participants as a means to acquire the resources they need. After a minor setback we are proud to present an extra large update. The server will be down while we apply the new version. We have been receiving inquiries about the status and possible ETA for the new VU. Even though we are not quite ready yet, we do have a teaser prepared for our dedicated fans. The server was patched and new clients are available. This release is mainly focused on bug fixes and improving stability and usability in preparation of future additions. The server will be down while we apply update 0.5.1 to the server and client. The new 0.5.0 alpha version has been released along with a change of names. - Team hunting. You can create a team in the options window (O) and invite players from the right click menu. - More items. 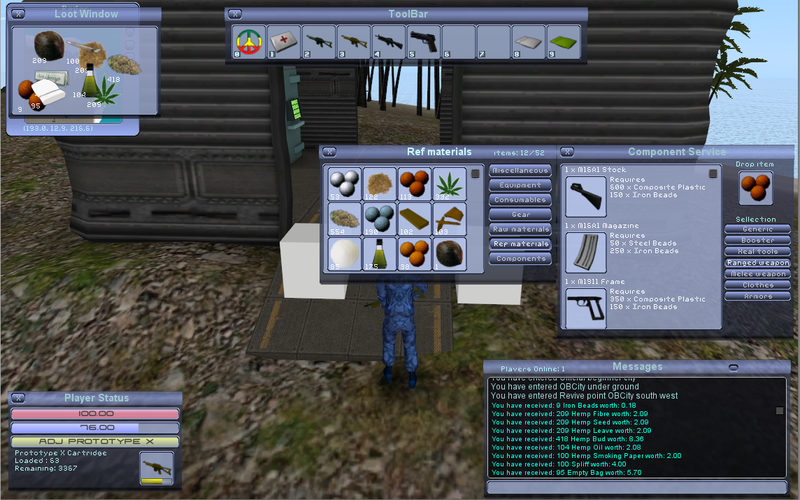 New items were added as potential loot including components and raw materials. - Bugfixes and optimizing. Always trying to squeeze as much out of the engine as possible. - Private Chat and Trading facilitates interaction between players and a platform that we can build upon. - Changes to allow making a selection and copy text from the chat window(s).